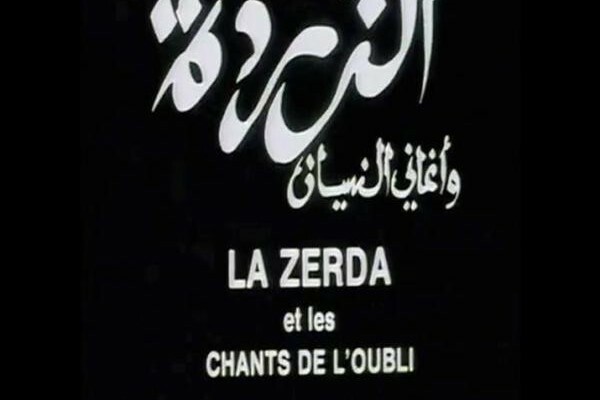 This film essay pieces together various photographs and footage of the Zerda ceremony from colonial archives, with anonymous poetic voiceovers recounting the lived experiences of indigenous Algerians. This pairing examines the contrast between the foreign perspective and the reality of the lives being viewed from that perspective, and the soundtrack is interspersed with “songs of forgetting” to recognize traditions that are being lost to colonialism even as they are tokenized by and subjugated to the colonial gaze. La Zerda ou les chants de l’oubli. Haus de Kulturen der Welt. La zerda ou les chants de l'oubli. Circle of Assia Djebar Friends. Donadey, Anne. “Rekindling the Vividness of the Past: Assia Djebar’s Films and Fiction.” World Literature Today 70.4 (1996): 885-92.